TALLAHASSEE, Fla. – March is “Spring Break” month in Florida, which means more traffic on state highways. And while vacationers are eager to get to their destinations, it is important for drivers to remember that aggressive driving is extremely dangerous, especially around large vehicles such as tractor-trailers or commercial carriers. The Department of Highway Safety and Motor Vehicles has launched its Ticketing Aggressive Cars and Trucks (TACT) safety campaign to reduce crashes between passenger and large commercial vehicles. Beginning today through March 26, Florida Highway Patrol troopers will be focusing on car and truck drivers who display aggressive driving behaviors. 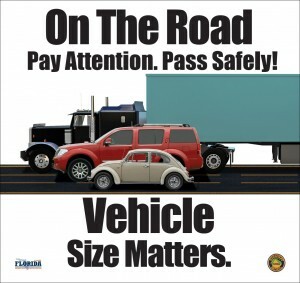 Stay out of the “no zone.” Large trucks have large blind spots in front of, behind, and on both sides of the vehicle. Pass trucks on the left side for maximum visibility. Avoid cutting in too soon when passing a truck. Large trucks can’t stop as quickly as other vehicles. Don’t follow too closely behind a truck; you’ll be in the rear blind spot and may rear-end the truck if it stops unexpectedly.